From a unique Greek dessert to tacos at Darwin Santa Maria's new Siesta Key restaurant, here are the 5 best things our panel of food experts ate this week. 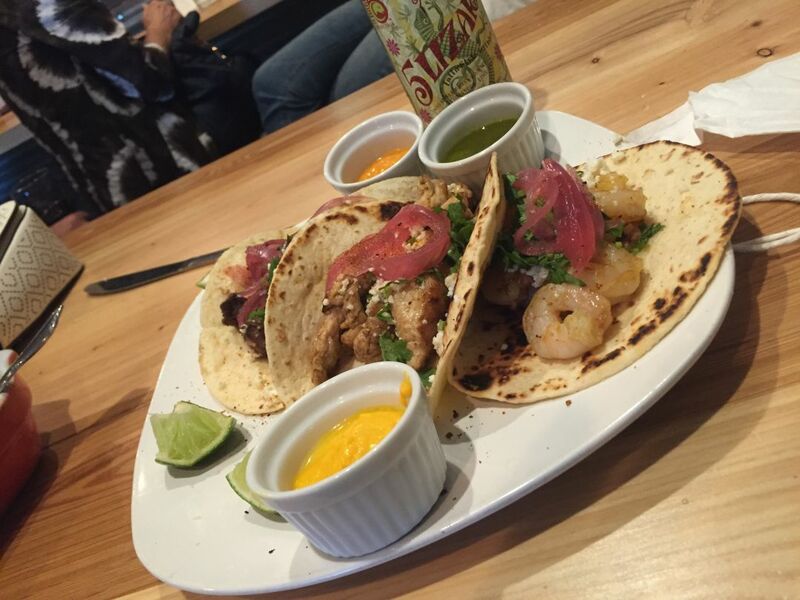 Darwin Santa Maria's new CeviChela is open on Siesta Key--run, don't walk, for the tacos. We got a combination of shrimp, aji panca citrus chicken and skirt steak, and doused the skirt steak in Darwin's famous chimichurri sauce. Totally delicious and perfect after a day on Siesta Beach. Savor Sarasota has gone gentle into that good night for another year, but luckily some of the dishes that were offered this season are year-rounders. Made's Savor brunch menu included its dynamite brisket eggs Benedict ($13), which is well worth seeking out any given Sunday. The dish is centered around a big pile of tender, juicy beef, drenched in hollandaise and accentuated with thick strips of "billionaire bacon," house-cured pork belly amped up with lots of brown sugar. On the side: more pork. Of course. We recommend starting your meal at the Mall at UTC's Seasons 52 with the lump crab, roasted shrimp and spinach-stuffed mushrooms appetizer ($9.50), which is served with a Parmesan panko crust. And a pro tip: Sit at the bar, where the mood is convivial and the service is prompt and friendly. At Apollonia Grill, the special Greek dessert the family-owned restaurant is offering is perhaps like nothing you’ve ever tasted or maybe even heard of. It’s called galaktobureko and it's comprised of a warm and crunchy phyllo-dough log that's filled with silky lemony custard and served with cold, creamy pistachio gelato. There are lots of flavors, textures and temperatures going on here, but trust us: it's truly delicious. Baker & Wife's crispy chicken and wonton salad lives up to its name--the salad is served in wonton bowl and filled with watercress, Thai basil, tomato, cucumber, avocado, watermelon radish, mint and fermented black bean vinaigrette. It comes with chicken, we but recommend adding grilled beef tenderloin, per the menu's suggestion.